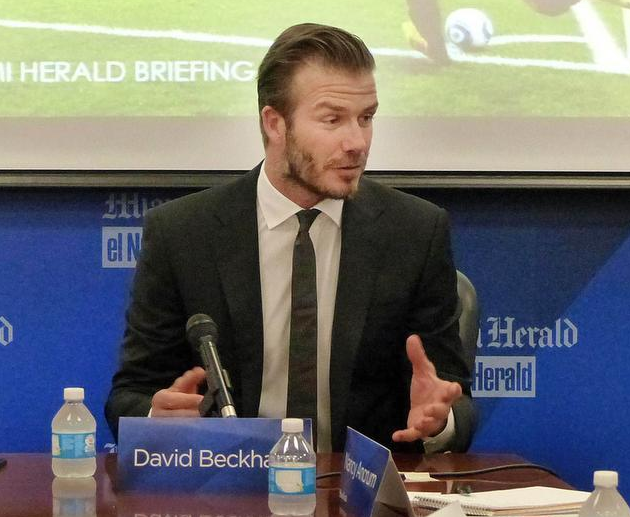 David Beckham told the Miami Herald editorial board that he wants to be ‘150 percent’ involved in his MLS team in Miami. And after years of corruption scandals, Broward County schools want $800 million to fix schools. The Broward County School Board will ask voters to approve a bond referendum to repair schools. Broward School Superintendent Robert Runcie says if passed, the measure will cost property owners an average of $50 more per year. Host Tom Hudson speaks with panelists Sean McCaughan of Curbed Miami, Dara Kam of News Service of Florida, Tim Padgett of WLRN-Miami Herald News, Matt Baker of the Tampa Bay Times and Scott Travis of the Sun Sentinel. Join us on Twitter at @WLRN and share your comments with the hashtag #FloridaRoundup. Miami-Dade Mayor Carlos Gimenez is proposing a new location for David Beckham’s soccer stadium, and it was on the radar six months ago. It’s a boat slip in downtown Miami on Biscayne Bay, between Museum Park and the AmericanAirlines Arena. Gimenez says the boat slip location would fill in the land and create a pedestrian walkway on Biscayne Bay. The location had previously raised environmental issues between officials. But Gimenez said that because the boat slip is manmade, he had gotten the okay from environmental groups. In our final installment of Session 2014: The Sunshine Edition, we highlight the big events from this legislative season. Stand Your Ground reform did not get far, but bills to allow undocumented immigrants to pay in-state tuition at state colleges and universities and to legalize a form of medical marijuana made it through the Republican-controlled legislature, and Governor Rick Scott says he will sign them. WLRN-Miami Herald News' Gina Jordan walks us through hallways of the Capitol in the remaining hours of the session. Homestead resident Mayra Rubio was in the audience during President Obama's 2014 State of the Union address and was hoping to hear about reforms that could change her life. She was an undocumented immigrant, though she is now a recipient of deferred action from U.S. authorities. While the president's speech said little about immigration, the state legislature is poised to pass a bill that will allow state colleges and universities to treat undocumented immigrants similar to in-state students and pay a lower tuition rate. Should The Panama Canal Join Classes As Well As Oceans? Jorge Quijano has one of the coolest office views in the Americas: the Pacific port entrance to the Panama Canal. The panoramic vista seems to help Quijano, who heads the Panama Canal Authority, see the bigger picture. On the one hand, Quijano understands why Panama has run the canal much more effectively than the United States did. Florida’s child protective agency’s new designated leader comes from within the troubled agency. Mike Carroll currently runs the Department of Children and Families operations in Tampa and Southwest Florida. What does his nomination mean about the direction of the agency? We speak with Carroll and the Miami Herald's Carol Marbin Miller. Florida parents, school kids and teachers await to see what next school year’s assessment test focused on Common Core State Standards will be. While they wait, they’re watching New York state parents opting out of Common Core testing.